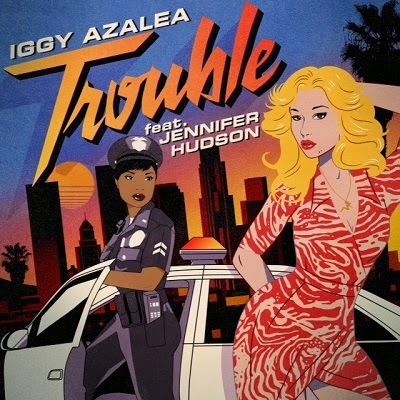 Monday 20th April sees the release of Iggy Azalea's latest single Trouble ft. Jennifer Hudson, taken from her recent album Reclassified. 2014 has been stratospheric for Azalea. She has been nominated for 50 awards including 4 Grammys, 6 AMAs, 7 EMAs, and 9 VMAs. She has sold 13 million singles, 1 million albums and amassed over a billion Youtube views. Impressive hey! She holds the record for both the longest reign at Billboard #1 for a female rapper, and in holding the #1 and #2 position on the Billboard Hot 100 for 5 consecutive weeks, she keeps company with the likes of The Beatles and Outkast. On new single Trouble, a Motown inspired, stripped back production courtesy of long-time collaborators The Invisible Men and Salt Wives, Iggy Azalea has teamed up with famed R'n'B vocalist Jennifer Hudson. Iggy's fiery rap takes on a softer, mellow tone as she laments about falling for the bad boy and leaves the chorus open for Jennifer Hudson's powerhouse vocals to shine. The video for 'Trouble', expected later this month, was shot in LA with Iggy Azalea and Jennifer Hudson and was directed by Iggy Azalea herself. Iggy Azalea made her mark across the globe following the release of her debut album, The New Classic last year, exploding onto the airwaves with her contagious hit singles Fancy ft. Charli XCX, dancefloor smash Work and Black Widow ft. Rita Ora. Shaking up her debut album, The New Classic, Iggy released Reclassified in November last year, a deluxe version of her debut featuring five brand new tracks and collaborations with global pop-sensation Ellie Goulding, new Danish buzz artist of the moment MØ, and Dreamgirls starlet Jennifer Hudson - all of which have been produced by The Invisible Men. Reclassified is out now and available to buy on iTunes now..!